Hi there, what I would like to do is have the projectile move towards the centre of the screen (where the crosshair is placed at) rather than just coming straight out of the characters chest and moving foward from there, is there a way that the projectile movement component can be changed or is there an option to allow for this, or would I have to use some other method of making the projectile move? As an extension, would altering the direction the projectile flies along randomly each shot be possible? Currently I just have the projectile fly out of the characters chest, but as you can see here, the projectile never actually meets the crosshair, and if the character is closer to the wall the projectile appears even farther from the crosshair. EDIT: As you can see in the image, the blue 'X' is where the projectiles spawn, the red arrow path is how they travel, which is not broken, that's how the projectile is set up, to fly straight forward from where it's spawned based on that direction, but what I want is to alter that direction so that the projectile always flies towards and eventually intersects the crosshair. So essentially I'm asking how to modify the direction of the projectile, or what direction I should go in to do so. Blueprint for reference, although it's nothing special or complicated. Would using the velocity vector input rather than the initial and max speed inputs of the projectile movement be a start? EDIT: made the picture clearer.. When spawning the projectile you need to have a spawning position and direction. Where are you taking these from? And another thing. Are you sure you want to have the projectile fly towards the center of the screen? In a third person game the camera is normally above and behind the character model. So a projectile flying towards the center of the screen would go up and backwards if spawned from the position of the weapon..
What I think you want to do is a line trace from your viewing direction to check if you are aiming at something and then fire a projectile towards the object you were aiming at. Alright, what I am doing is spawning the projectile like normal, it uses the the camera booms location which has been offset by a small amount, and it also uses the rotation, when it spawns the projectile movement kicks in and it flys straight. 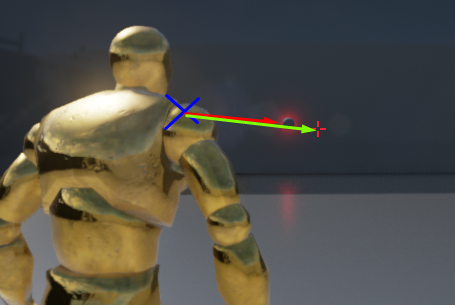 My problem is that it's not moving towards the crosshair, I would like to fire the projectile from the character and have it move towards the crosshair. I don't really know how else to explain it. I think both of you are mistaken. Also possible that I am but let me explain. What you want to do is spawn a projectile at your weapons position and let it fly towards your target. The question is what is your target and that is what you have to find out. So here's what I did. I don't know the best practices, but this worked for me and I was stoked! So I [ Get Player Controller > Convert Mouse Location to World Space > World Direction plugs into my rotate vector ] after this everything is plugged into the spawn projectile the same way the first person blueprint has it set up (make transform > spawn transform etc). The blueprint is probably clearer than my explanation. Let me know how it goes, I'm so new to UE4 that even if I get something to work I may not fully understand/comprehend it. Check my answer to this question for 1st person... it's essentially identical. For bullet spread, you can simply get some random vector of a small size and apply it to the Trace Hit position. This would simulate that for you. Edit: The "Shooter Game" example does the things you are looking for. Proper aiming with an offset muzzle location as well as bullet spread. !This not a complete answer! What you can do here is to make the projectile fire straight at the cross hair. To do that you need to convert the screen coordinates into world position. At the moment I could not find the right blueprint node to do that. I heard that such a node might be available in 4.3 release. The following BP shows the general idea. But it uses the mouse cursor position instead of Crosshair (UE4 already has a node to de-project mouse cursor location). So it will fire staright at where you are positing with the mouse (you must enable Mouse cursor in PlayerController settings). The shooter game doesn't really help because it seems a lot of the important stuff is code based rather than blueprints, if it is blueprints it's hidden really well because I couldn't find it. The problem with your blueprint is it doesn't apply, what yours does is fire the projectile from the mouse position, whereas I want to fire it from the character to the crosshair position. What I'm struggling with is finding a way of saying the direction of the projectile is the the direction of the crosshair in accordance to the spawn area. As you can see in the screenshot, the blue x is where the projectiles essentially come from, the red arrow is where they travel which is fine because that's how it's currently set, but what I'm aiming for is to have the projectile hit the crosshair rather than off to the side of it. At the moment this can be done in C++, but with blueprints, looks like we will have to wait for 4.3 release. Is your cross-hair always at the center of the screen? Ahh I see now, sorry I misread slightly, it's a shame that it's only available in C++ currently, hopefully 4.3 is quick to be released then. It's still in the air as to whether the crosshair will move or not, but presently it just sits dead centre of the game window. I've tried some some extra things, like calling a trace and then getting the angle between the trace end and the camera world location, and using that angle as the rotation, which sorta worked, but if the trace didn't hit anything it would go funky. Thank you for your help regardless. I think I understand. IF your cross-hair is always at the middle of the screen, the above blueprint will make sure the projectiles go toward the cross hair (provided the projectile's Gravity multiplier is 0). I will let you know if I find anything that might help you. Meanwhile try the forums too. I was having an issue with firing in third person. I think I've got it mostly figured out (I haven't done anything with the spread part though). I was having the same problem where it seemed to always be off to the left a little bit. With the spread, it would probably be a random value between two small numbers (like -5 to 5) for x, y, and z values. Each having their own random float in range node so the random number is not the same for each axis. Set rotation to zero. It should solve your problem ;). I've sorta changed how I implemented it originally mainly because it was giving me a headache, as someone mentioned before you can now use a node called 'convert screen location to world space' and use that to set the end point of the 'find look at rotation' node along with some other trickery to get the projectile movement. What I am doing now is just using a couple of traces to first get the distance to any vision blocking thing, which will set the distance for the actual shot trace to set itself to. I'd really appreciate seeing a BP of this as well... I sort of understand the logic behind how it works but don't know how I'd start to implement it. Tesla Dev has a tutorial on this. Do a google search for Simple Line Trace Tesla Dev. The crosshairs that is displayed with the FPS template is not quite in the center of the screen so it will look a little off when shooting. With a trace things will have to work a little different, but even then there are a couple of variations, there could be a bullet blueprint that casts the trace by itself, or the trace casting could be based straight in the character actor... Tesla while great keeps things simple, and bullets can get very complex if need be. Hey Recker I saw your video on YouTube and shooting towards crosshair is now working! I have tried almost all answers on internet but none of them is working for my projectile and I feel weird... I really need help on this. This is what I have but it is still off. I am having my shooting logic in Character BP class. I have a muzzle location on top of my character and outside of my capsule component. Tesla Dev has a tutorial about this. Search for Simple Line Trace Tesla Dev. Also note that the crosshairs that's on the screen for the first person template is not quite in the center of the screen. It's very close but not quite. No it doesn't work for me I tried. I am using my camera to adjust my projectile arc in future (like projectile in GoW). And based on my BP I can't see what is going wrong, but the projectile is not flying to crosshair. Hey there, sorry I have long since lost the original files for those projects including the stuff I put on my youtube... I think what I did was cast a trace from the camera straight forward using the cameras rotation, while also getting the forward vector and setting the length to about 200 meters, and then I store the hit location if the trace, after which I spawn the projectile blueprint OR cast the actual projectile trace from the character...Directly after that spawn I grabbed the spawned actor and set its rotation with a find look at rotation node, using the spawn location and the hit location.... what you can then do after is add some variation to that by breaking the rotation before its set, and adding a random node on each of the rotation axis, that will simulate spread... you could also do another thing where if the trace doesnt hit anything you could set a bool variable or something you just set the target of the find look at rotation node to a large number like 200 meters from the players position. Thank you for the explanation! cyborgjynx has helped me out. I am pretty sure I get my projectile flying to crosshair correct now, but like he explained, the crosshair itself is a little bit off since I am now using the crosshair from FPS template. Gonna fix that now. Thanks again! In the line trace start use the cameras location and not the muzzle location. It works now! I am using the same crosshair implementation as FPS template so it is a little bit off but it is a constant of no matter how I change my camera location or rotation. Can you explain why this does the trick please? And can you point me a place to find a good crosshair implementation? Thanks you so much!!! I see... but using camera location as start position for line trace solved the problem for now... Or I think I can create an empty mesh on top of my character's head and aligned with camera location. What did you use for that start point? Is there a simple way to get bots into the Blueprint Third Person project? Event any damage not working.